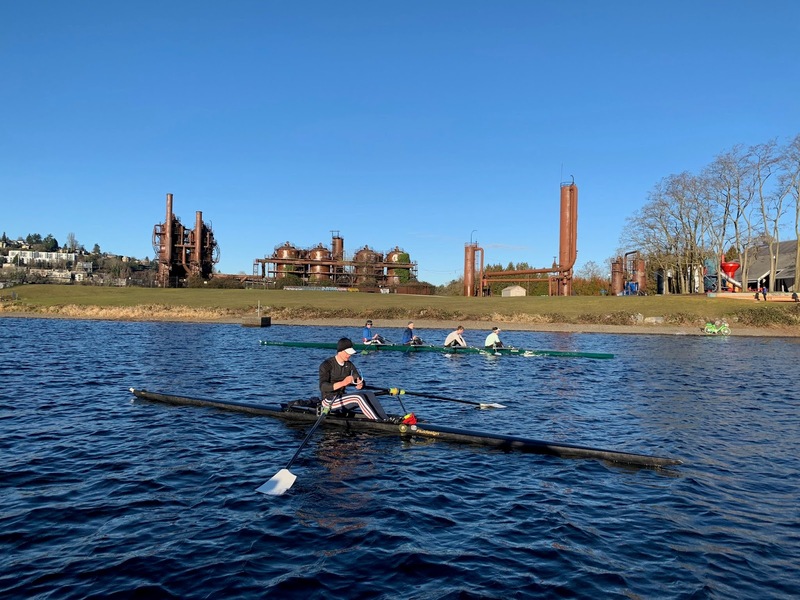 Notes on the sport of rowing, shared by David O. Smith, Lakeside Crew 2001-2004, Dartmouth Lightweight Crew 2005-2008, USA National Team 2012, 2013, 2015, 2017, 2018. Currently at the Pocock Rowing Center in Seattle, WA, 2016-present. Here is some video from Sunday's practice in our San Diego "Coach 8+" boat. Training Update - One week until San Diego! I really enjoyed this week's training. Having company yesterday in the singles and today in the eight is just about the best part of our sport. 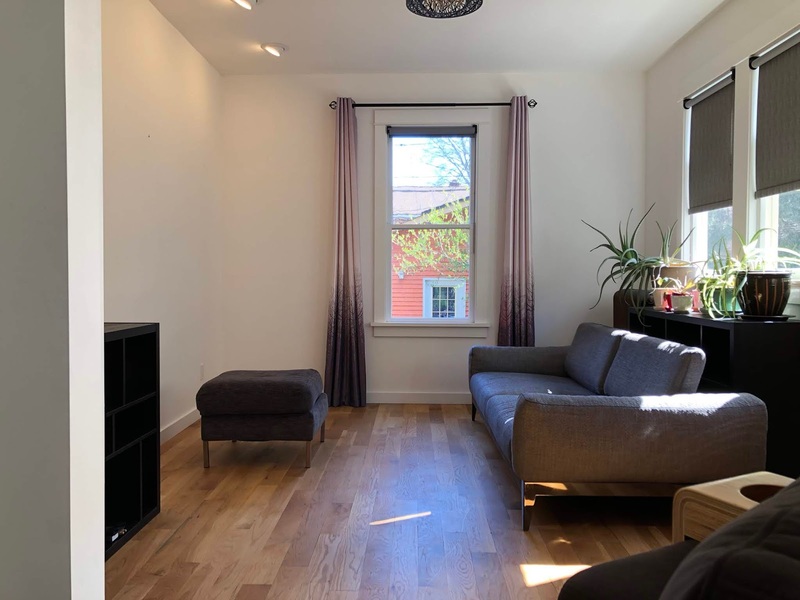 Individual expansion is more likely and more enjoyable when there's a communal purpose. 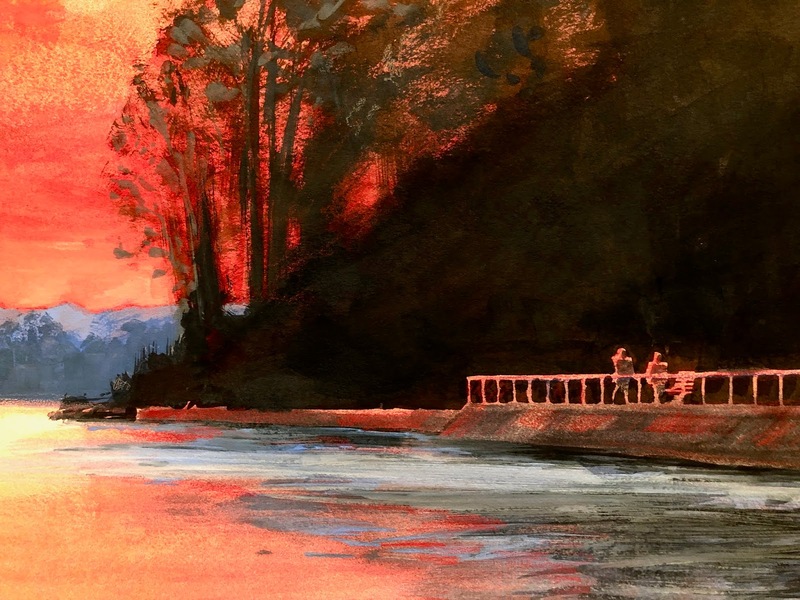 Although this blog is primarily to share my thoughts on rowing - here is an artwork post related to rowing. 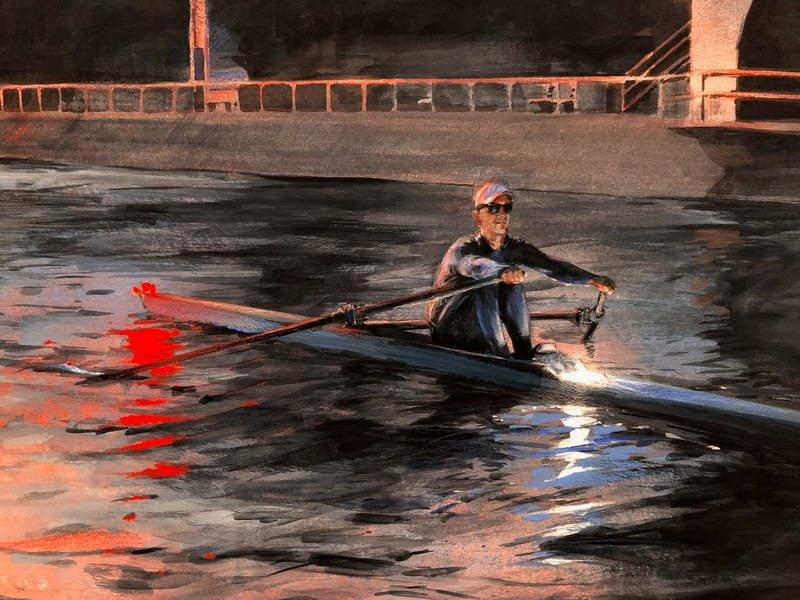 This is a commissioned portrait of a sculler. I have painted portraiture and rowing, but this was my first time combining the two. I am currently accepting commissioned work, portraits, or other projects. If you would like to talk about commissioning or owning some artwork, please don't be shy. You can reach me at David.o.smith.games@gmail.com. 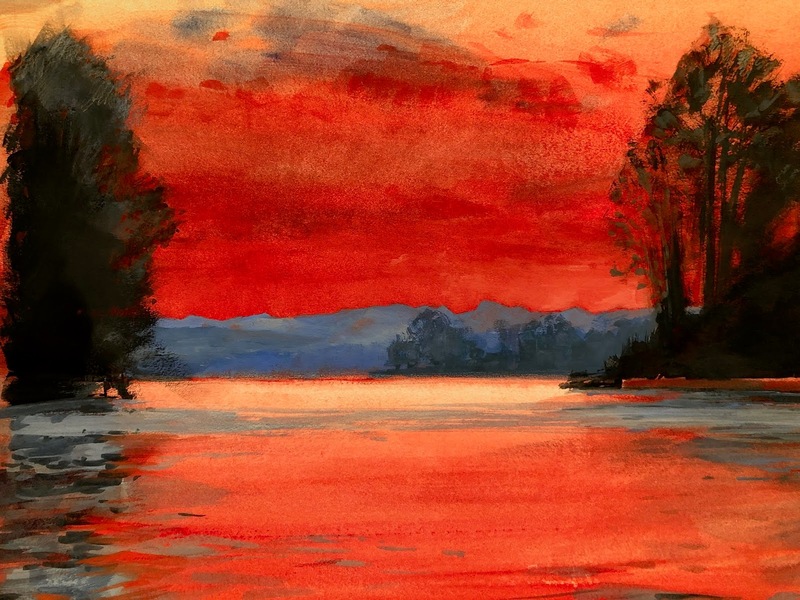 If you would like to see some of my recent work, check out my website, davidosmithartist.com, or if you prefer to see paintings in person (it’s always better in real life) I currently have a show for the rest of April at Bottlehouse Seattle, 1416 34th Ave, 98112, in Madrona. Alternately, we could schedule a time for a viewing of the work I currently have in my studio. I've included some details below, as well as a picture of the studio viewing room. It was a very fun week. The intensity was up and the volume was down thanks to many key players and friends in the sport. Jeny (Coach of the Ancient Mariners) and George (Ancient Mariner) let me join them on the static erg Thursday morning. Jeny and I had just finished coaching, while George had finished coxing. Everyone had fuel to burn. At Jeny's prescription, we set it up for 10x1' on / off at SR30, and two race pace 500m pieces after. I could not believe how difficult those 1' pieces were. Perhaps it was my lack of erg warmup, but I invoke the wisdom of my good friend and many-times National Teamer Shane Madden, the day was "a shock to the system". By contrast, the 500m pieces after felt relatively easy. If you don't try, you never learn! Thank you Jeny and George. Thanks to the 5-7am Pocock Masters Sweep team and staff, I was lucky enough to hop in with two quads from Pocock, with Grant in the launch keeping our bowballs safe and our strokes sharp and intense. We did four 500m pieces in the dark, all four of which included some tight and vicious racing. I loved it. Thank you all for giving your hardest toughest strokes, and thank you Grant and Coree for the tough pieces. My attempt at lifting in the afternoon was lackluster if I'm being generous. Thank goodness the company was warm. It is always a pleasure to share the gym with my friend and former teammate Alex Twist. That morning into the early afternoon Pocock had put on an Open House for our adult rowing programs, and if I'm honest I was a bit wiped out from the excitement and work of the day, beginning at 9:30am and wrapping up at 1:30pm. Typically a coached rowing session lasts about an hour to two, but this was an all-day effort. At the Open House, it was my pleasure to coach some friendly new faces who are just entering into or returning to the sport. If you were there, thank you for letting me chat you up about how you could fit in and make rowing a part of your life. If you missed it and you still want to try rowing - come on down during business hours (9-5 M-F, 3320 Fuhrman Ave E 98102), reach out to me, or check out the brand new Pocock Rowing Center Website. If you are wondering if rowing is for you - you'll never know unless you try. We believe rowing is for anyone who wants to row. You can be part of a team here. You can be competitive or recreational. You don't even have to ever actually row on the water. You could be a gym water rat or full-time erg monster. You can enjoy seeking perfect strokes. You can fall in love with a new passion, but you don't have to! This morning was the capstone of the week. James, myself, Daniel, Grant, Khalid, Ben, Rob, Derek (thank you again for subbing) and Delaney with Margaret in the launch, got our San Diego Coaches' eight moving better than usual, and for longer than usual. The workout was very fun and difficult, and doing our 1500m, 1000m, 500m, and 250m pieces on a race course with lanes felt that much more official and race-like. We are all grateful for getting our butts handed to us last weekend at the hands of Seattle U, and cannot wait to square off against more competition in the lead-up to our Master's race in San Diego. As James said, perhaps in reference to the extra minutes these guys have been investing lately in their physicality, "witness the fitness". Absolutely no promises as to how our eight is going speed-wise, but I can honestly say the boat is fun to row. Thank you guys and gals for all saying yes to this. To the people who have offered supportive gestures this week in regards to the work I've been doing in art - I cannot thank you enough. I draw and paint for you. You are heroes. 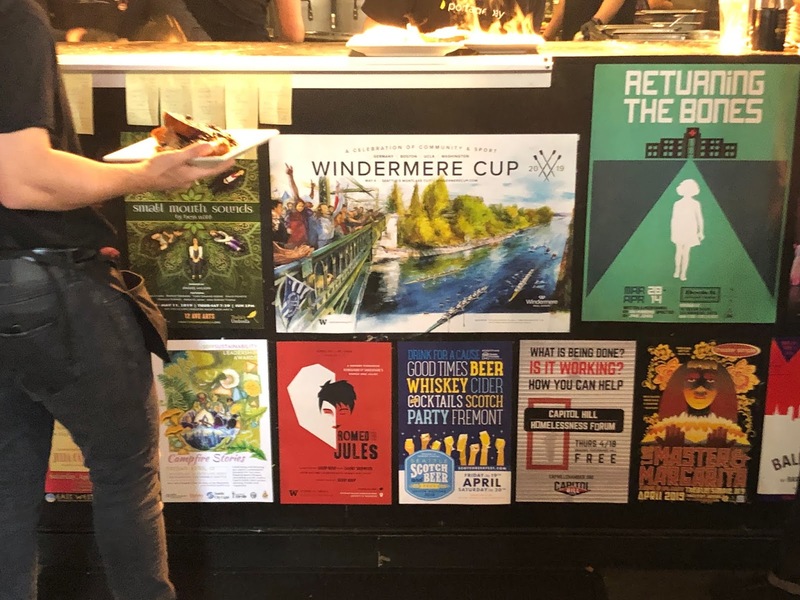 The 2019 Windermere Cup Poster at Portage Bay - Mark your calendars for Saturday May 4th, 10am to noon! Labels: 500m, art, artwork, crew, David bowie, eight, George, get it, heroes, jeny, open rate, pieces, racing, Rowing, San Diego Crew Classic, SDCC, Sunday, Thor's day, ya! Training, Work, and Fun all took it out of me a bit this week. 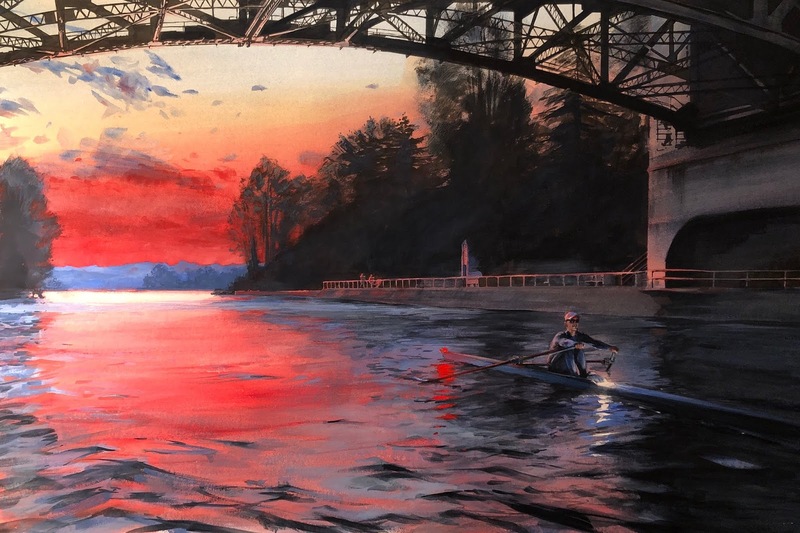 Thank you to everyone involved in Saturday's Birthday celebrations, especially Sarah Smith - you are truly an inspiration, and I hope you don't mind if I share the rowing videos from the morning's 22.5k row on a glassy Lake Washington. Sunday (today) our San Diego eight mixed it up with the Seattle University crew - a big thanks to them and their coaching staff and to Margaret for making that possible. For the guys who weren't in town today - looking forward to having you back and doing some more side by side racing. Thank you again to Margaret for letting me drop in on the last twenty minutes of your Friday morning sculling class, and for taking the pristine video. I'd like to share those here, and the full training details are below. 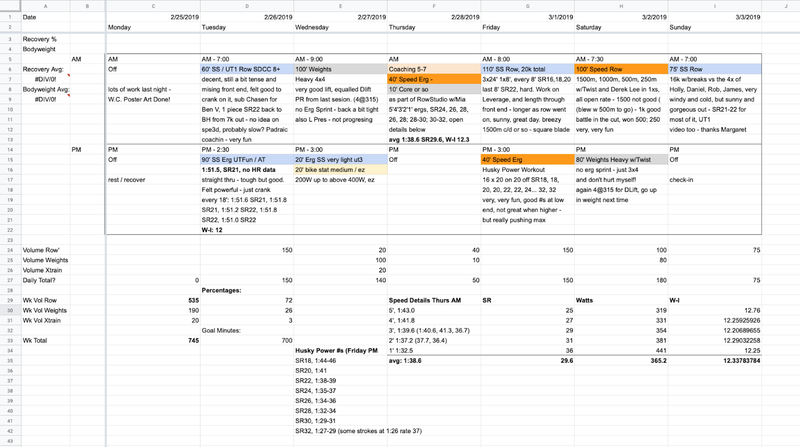 It was not my most consistent week, but it was one of the more enjoyable weeks wherein I have had to adjust the plan or take days off. 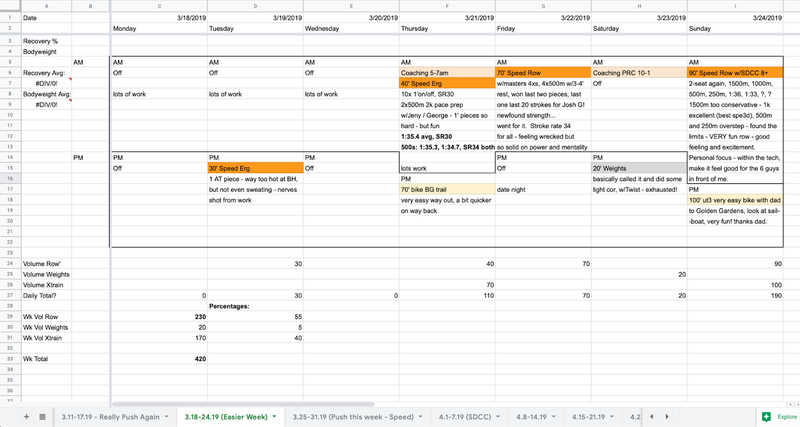 Typically when I have to scratch workouts due to fatigue, scheduling, or some other factor, I'll get hung up on it, adding unnecessary mental stress and guilt to the mix. In moments when you cannot complete the work you had previously set out for yourself, it's important to keep rational, and leave emotional self-criticism out of the equation. If you truly do need to adjust your plan based on the physical limits of your one body, so be it. Adjust and never look back, and use that time wisely to let the body rest and keep your work and schedule on track. On Wednesday I crashed a bit. I'd been going for eight days in a row, pushing my limits as hard as I can at least once each day, whether on weights, on the erg, or in the boat. Thursday and Friday of this week I did no physical training at all, using that time to work on artwork and curatorial organization. After coaching the Montlake Rowing Club Saturday morning (very fun! ), I met up with Alex Twist that afternoon to lift weights. After the initial stiffness and awkwardness, it felt right to move and sweat again after two days off. I was feeling good, so I went for a personal best on the Hex Bar Deadlift. The numbers are probably not much to those of you who lift for sport, but for me, it felt good to do slightly better than before. Holly was there doing some strength training as well, and we all had fun chatting and getting stronger (Speed-Gods-Willing). Today's row in the San Diego Crew Classic eight was among our best yet. A big thanks is in order to Sam for stepping in to cox, to Derek and Jeff for subbing into seats 6 and 4, and to Alex Mann for letting us join his junior boys practice out of Pocock to get in some side-by-side steady state rowing on a glass-flat Lake Washington, interspersed with 10s, 15s, and 20s at 2k pace and faster. Alex, your coaching phrasings and calm voice were huge positive factors - thank you for letting us go out with your boats. I hope before we race in San Diego we can run this back a few times, provided the junior boys got half as much out of it as we did. They are very quick, and very hungry. Ever the master of evening-time promise fulfillment - James (in bow of the eight) gave me a gift this morning I can't wait to wear at every opportunity. Thank you James for the new threads - let's show off our matched and unique sense of "fashion" at the boathouse this week. Looking forward to the next row in this boat, complete with the guys and gals who couldn't make it today. You were missed. It's been really fun getting out on the water a bit more, and in good company. Tuesday morning was a glorious row in the sun in our SDCC 8+, thanks to a few people subbing in as well as Padraic coaching from the launch. It was encouraging to be bending the oars less cautiously than we have been, and to not be in the single or on the erg while doing so. I had some more energy to burn off so set up the erg for 90' in the evening and went hard at SR21-22. 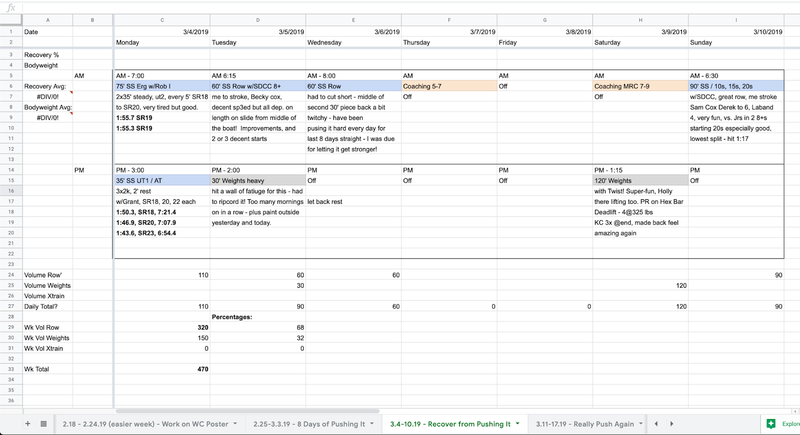 Thanks to Mia (new PRC hire, former National Champion with the Cal Women's Team) I had encouragement and accountability for Thursday morning's speed erg, plus instead of rest time in between the pieces - jump squats, planks, pushups and bouncies! Her RowStudio class was a blast. Friday night I did what I believe to be the workout these guys are doing in this video - as always it's inspiring to share the water with UW - their rowing keeps stepping up to new levels. Saturday, meeting up on the water with Alex Twist and Derek Lee was just too fun. We did 1500m, 1000m, 500m, 250m, all open rate, all just racing. I don't think I looked at the speed coach once - just tried to win.